Repair corrupt OST and convert into PST, MBOX, EML, EMLX, MSG, HTML, vCard, vCal, Live Exchange Server, and Office 365 file types. Complete Conversion of .OST mailbox contents Emails, Attachments, Calendar, Contacts, Notes, journals, and all mailbox elements. Restore all properties: such as: To, BCC, CC, time, subject, images, date, & all attachments, etc. Convert OST items into various file types such as PST, MBOX, EML, EMLX, MSG, HTML, vCard, & vCal. Restore deleted/ permanently deleted OST emails items. Free Preview lets access to each message before actual conversion. Convert OST file and import into Office365 & a Live Exchange Server. Advanced option to export selected items only. Splits Converted OST files into Smaller Outlook PST Files(s). Support conversion of OST files into MBOX for Mozilla Thunderbird & Apple Mail. Export OST contacts & Calendars into vCard and vCal file format respectively. Convert corrupted, password-protected, and highly encrypted OST files easily. 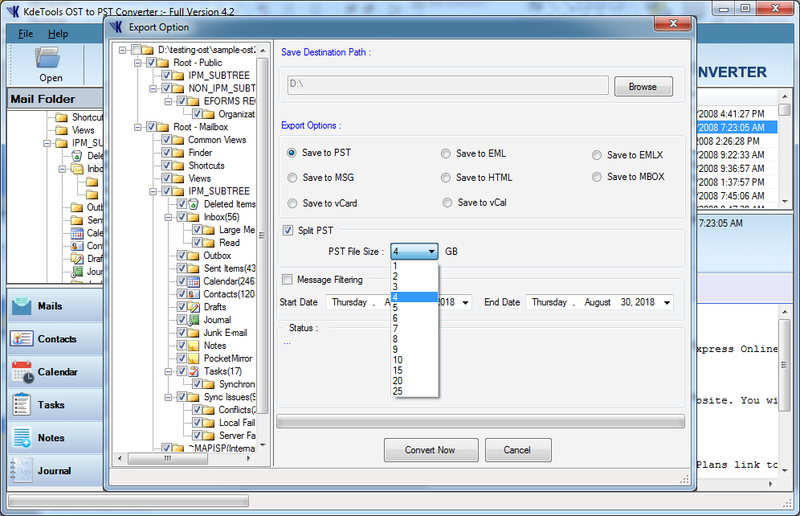 Advanced data Filtering Options to save data between Two Specific Dates. Supports MS Outlook 2019, 2016, 2013, 2010, 2007 & earlier versions. No File Size Limitation and recently successfully converted a 215 GB file. *Demo Version Recovers/ Preview complete OST items and allows to save only 30 items from each folder. 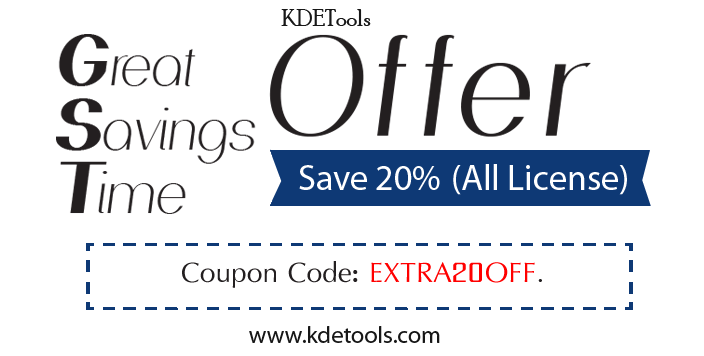 "After reading all the mix reviews about the kdetools software company, I was in doubt but I took a risk (because I wanted to migrate my .ost file data directly into live Exchange server mailbox). But after purchasing & using its software, I want to say that company's service is above the expectations." Vielen Dank für OST nach PST konvertieren !! Diese Anwendung hat die Möglichkeit, jede OST-Datei Problem zu entfernen und einfach OST-Datei in Outlook PST-Format zu konvertieren. Thanks You, the order worked very well and I was able to recover my OST files and convert to Outlook 2013 PST file format. Many Thanks for Your Help. La suppression accidentelle ou le compte configuré dans MS Outlook est une raison pour convertir le type de fichier OST en fichier PST. Merci à KDETools de m'avoir fourni une solution si merveilleuse. The OST to PST converter tool allows users to convert OST file(s) to various file types such as Outlook PST, MBOX, EML, EMLX, MSG, vCard (for Contacts), vCal (for Calendar), HTML, Office 365, and Live Exchange Server. 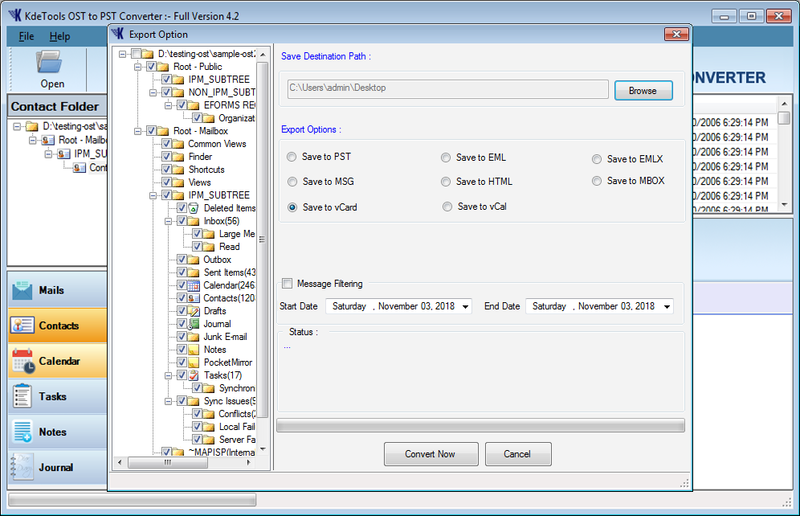 *Message filtering option (as per Date) is available for all file formats. 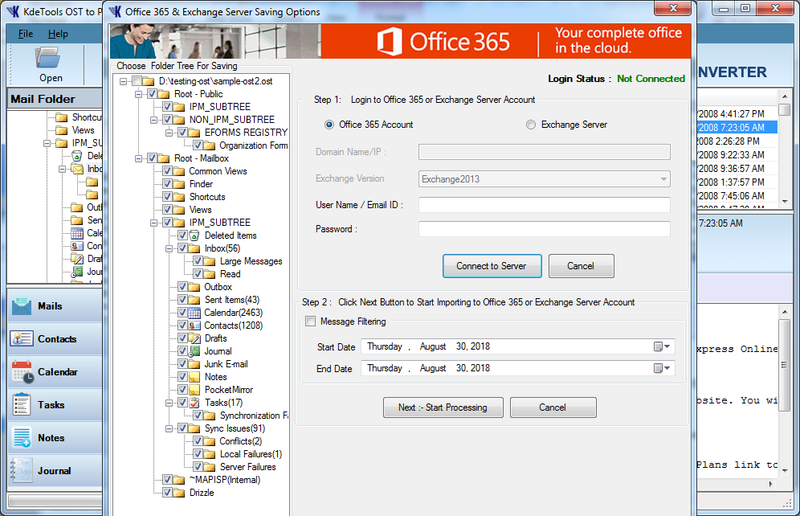 This tool facilitates you to import OST files to Office 365 and Exchange Server directly. You can also use the Message Filtering option to move desired emails as per given specific date range. *Software is embedded with highly secured techniques that provide complete data security. The software easily supports to convert complete OST items such as Mails, Contacts, Calendar, To-do list, Journals, Notes, Tasks, Folders, Sub-Folders, etc. without losing any single bit of data. *During file conversion it maintains Files and Folder structure in their hierarchical order. Properties of all items will be restored in its original form. This is the single tool which provides multiple functionalities so that users can easily complete all their requirements in a single place. *The tool easily convert PST, OST, and NST files to the desired file format along with that you can also move these files to Mail Servers like Office 365 and Exchange Server. *You can also combine all these options for better file management like you can split the file as per Size from a given data range. This application provides advanced scanning and OST recovery options by which helps users to recover items from Corrupted/Damaged, Highly-encrypted, and password protected OST files. *Software automatically detects and fixes OST corruption issues. Software exports OST Contacts and Calendar to vCard and vCal file types respectively. This option will help you to move Contacts and Calendar to any supported platform. *It converts/exports all details such as Fields, Additional fields, Contacts Images, Properties, etc. The software keeps all email Meta properties such as To, Cc, BCC, Sent/Receive date & time, attachments, etc. as it is as before while converting OST file to any file format. Along with that, it also maintains original files and folder structure. *There will be no changes done in the internal hierarchy of emails or folders and Meta properties. 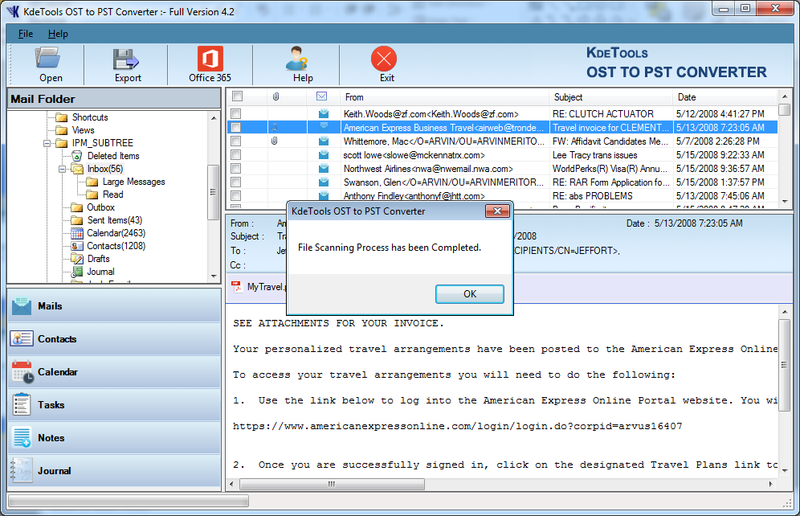 The OST to PST converter by KDETools allow users to have a full display "Preview" of recovered OST email items including all Folders, Sub-folders, Email messages, Address Book, Contacts, Attachments, Embedded Images, HTML Formatting, Deleted folder, etc. *Preview facility is available in the free demo version that enables you to preview complete OST items. *Software supports all OST files, whether it Orphaned, IMAP, or Exchange Server file. 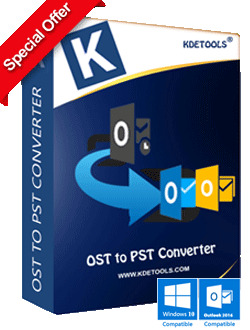 Download, Install, and Run KDETools OST to PST Converter. Select OST files that you want to convert. Check full the preview of OST file contents. Click on the "Export" button and choose PST from saving options. *You can also choose other options as per need like MBOX, EMLX, vCard (for Contacts), vCal (for Calendars), etc. Click on "Browse" button to save destination path. Click on the "Convert Now" button to start conversion process. Note: Converted PST files can be easily imported in any version of Microsoft Outlook. Does The Software Export Emails Attachments, Contacts, and Calendar From OST To PST? Yes, the tool converts complete OST items into PST for Outlook such as Emails, Contacts, Calendar, Attachments, Tasks, Notes, Email Metadata, etc. Does The Tool Make Any Changes in Files/Folders Structure and The Email Properties After Conversion? No, Software does not make any changes in original files/folders structure and email's properties. It provides exact data as it is as before the conversion. Which File Formats are Supported by your Software When it iaves the recovered emails? The software supports converting OST files into multiple file formats such as PST, MBOX, MSG, EML, EMLX, HTML, vCard, and vCal. 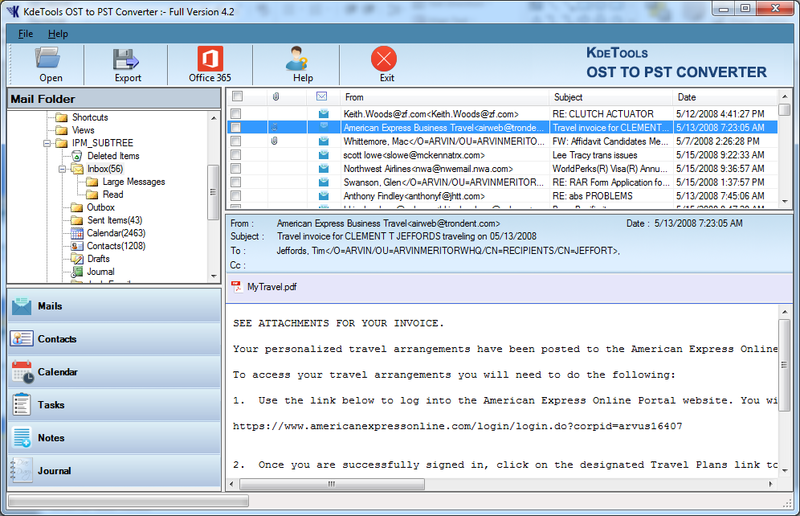 This tool also moves OST file to Mail Servers like Office 365 and Exchange Server. Can The Tool Convert Heavy Sized OST File? Yes, the tool easily converts heavy sized OST file. It is also helpful to split the resultant file into smaller parts. Is it possible to Read Some OST Emails Without Buying the Tool? Yes, we provide a FREE demo version by which you can easily check the preview of OST file contents including Emails, Contacts, and Calendar. Is there any Need for MS® Exchange Server Services While Performing OST To PST Convert? You are not required to have Exchange server services when it is to convert OST to PST. 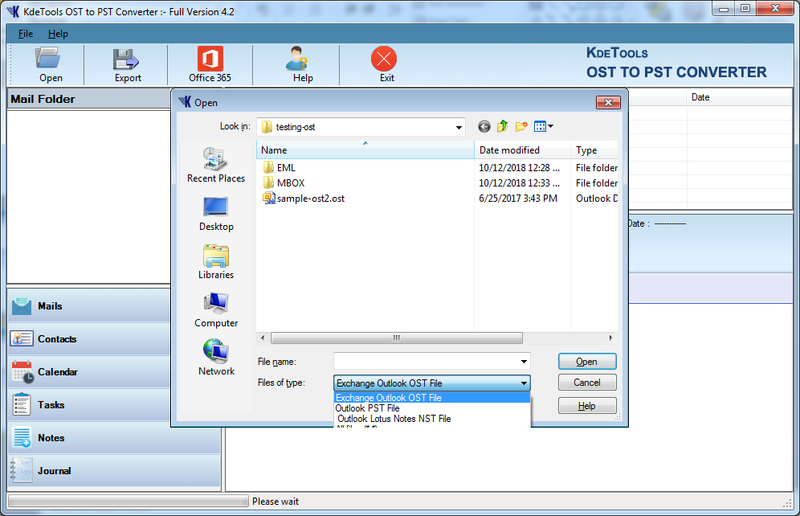 Does the OST to PST Converter Need Original Outlook Profile For Recovering the OST Files? There is hardly any requirement for the original Outlook profile when it recovers the OST files into Outlook PST.